Baltimore orioles arrive in Maine at the beginning of May, and often depart before the end of July. They spend most of the year in Central America, although small numbers winter in southern Florida and the northern tip of South America. Baltimore orioles are among the migrant birds that benefit from shade-grown coffee plantations. One good way to start an argument among birders is to question which of our Maine birds is the prettiest. Most of the contestants in this beauty pageant are red, blue or yellow. The Baltimore oriole should get some votes, if only because it is brilliantly orange. I grew up with orioles. They nested in the elm tree across the street. That is, they nested there when there were still elm trees. It was a sad boyhood day when those diseased trees came down. I wouldn’t encounter another oriole for years, until I discovered them feasting on tent caterpillars in Waterville, not far from … wait for it … Elm Plaza. Our time for enjoying these Day-Glo birds is brief. They arrive at the beginning of May, and often depart before the end of July. They spend most of the year in Central America, although small numbers winter in southern Florida and the northern tip of South America. Baltimore orioles are among the migrant birds that benefit from shade-grown coffee plantations. Spending all that time in subtropical habitat explains how orioles can get away with being so colorful. Brightly hued birds ought to be easy targets for predators. But the tropical environment is filled with flamboyant flowers and fruits. Colorful birds blend in. Furthermore, orange color is sometimes used as a defense in the tropics, warning that the target may be too toxic to eat. Although female orioles are duller than their mates, they are still bright enough to be easily seen squatting on a normal nest. So the oriole weaves a hanging pouch so deep that she is completely hidden. Once the leaves fall, it’s easy to see the nest, since it tends to be at the drooping end of an upper bough. But in spring, the nest and the female inside are virtually invisible. When orioles first return, they are noisy and conspicuous. Savvy bird feeders put out oranges for them, cut in half and mounted on each side of a hanging board, or dangling from string. Orioles love it. They also like little dishes of fruit jelly. As summer approaches, there is more natural food around, and the oriole feeder visits abate. The bulk of their diet consists of insects, beetles, spiders and even small snails. The female chooses the nest site and weaves the nest. Weaving such a complicated structure takes a week or more. The male may bring a little bit of nest material, but his job is primarily to stand guard and protect the territory. Territories are small, relative to other birds, and several pairs can occupy the same general area. Incubation lasts up to two weeks, and it takes another two weeks to fledge the chicks. The whole process keeps both parents in one spot for a considerable period. Once nesting commences, the orioles are much less noticeable. Essex Woods in Bangor has multiple breeding pairs. It’s common to see them in May during a walk around the wetland. But by June, the orioles become shy and harder to find, as they forage in the treetops and try not to attract attention to their nestlings. It’s hard to imagine that such a brightly colored bird can just disappear, but it does. The Baltimore oriole’s love of fruit is one reason why it is generally a suburban bird in Maine. Orioles appreciate the ornamental fruit trees and berry bushes of backyards. Sometimes they damage fruit intended for human consumption, but more often they devour pests, such as tent caterpillars, webworms and gypsy moth caterpillars. As is the case for many of our songbirds that winter in the tropics, orioles have declined over the last 50 years. Tropical deforestation and overuse of pesticides are the chief threats, but they also risk the dangers common to all birds that migrate at night, including collisions with towers and tall buildings. 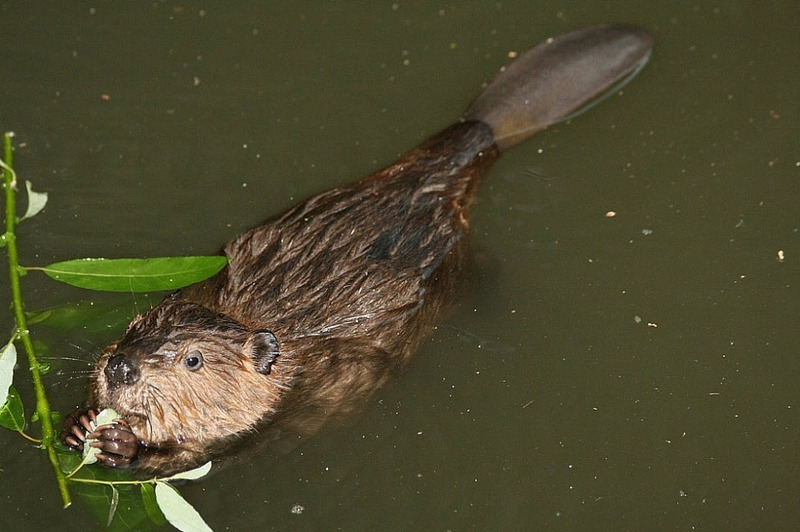 Nonetheless, they enjoy a wide breeding range from the Rockies to Maine, and Louisiana to Canada. Despite their ostentatious color, Baltimore orioles are members of the blackbird family. The bird is named for Lord Baltimore, who established a British colony in Maryland in the 17th century, and whose family crest was bright orange. 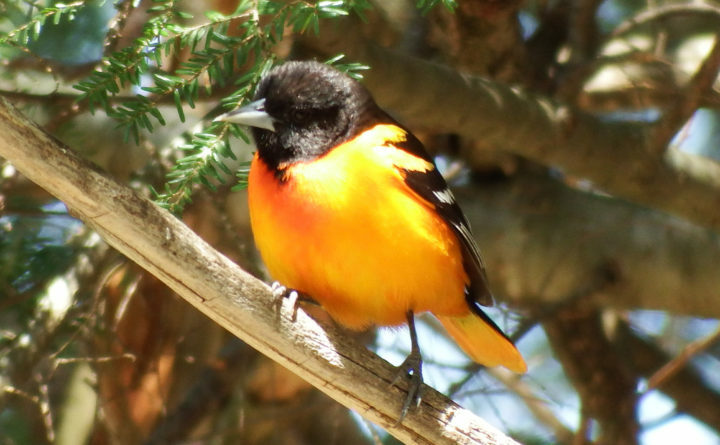 The Baltimore oriole is the official state bird of Maryland, and is the mascot of the Baltimore Orioles baseball team — a team so pathetic this year that the real orioles have requested a name change. Go ahead and argue on behalf of the northern cardinal or scarlet tanager as Maine’s prettiest bird. I’ll take the oriole.